China Airlines (CAL) (Chinese: 中華航空; pinyin: Zhōnghuá Hángkōng) (TWSE: 2610) is the flag carrier and largest airline of the Republic of China (Taiwan). 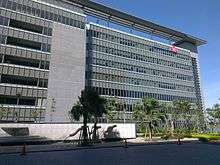 It is headquartered in Taiwan Taoyuan International Airport and has 11,154 regular employees. China Airlines operates over 1,400 flights weekly to 118 airports in 115 cities (including codeshare) across Asia, Europe, North America and Oceania. The cargo division operates 91 pure freighter flights weekly to 33 destinations. The carrier was, in 2013, the 29th and 10th largest airline in the world in terms of passenger revenue per kilometer (RPK) and freight RPK, respectively. China Airlines has three airline subsidiaries: Mandarin Airlines operates flights to domestic and low-demand regional destinations; China Airlines Cargo, a member of Skyteam Cargo, operates a fleet of freighter aircraft and manages its parent airline's cargo-hold capacity; Tigerair Taiwan is a low-cost carrier established by China Airlines and Singaporean airline group Tigerair Holdings. With a fleet of two PBY Amphibians, China Airlines was established on December 16, 1959, with its shares completely held by the Republic of China government. It was founded by a retired air force officer and initially concentrated on charter flights. During the 1960s, China Airlines was able to establish its first scheduled routes. In October 1962, a flight from Taipei to Hualien became the airline's first domestic service. 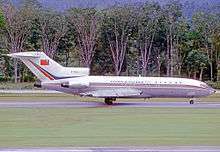 Later, with the introduction of Caravelle and Boeing 727-100s,the airlines introduced international flights to South Vietnam, Hong Kong, and Japan. With the airlines' first two Boeing 707 aircraft, trans-Pacific flights to San Francisco via Tokyo were initiated on February 2, 1970. The expansion of the company's 707 fleet also permitted more services in Southeast Asia, Northeast Asia, and North America (via Japan and Hawaii). Following the standard utilization of the wide-body 747 on the highly profitable Trans Pacific – USA routes, China Airlines introduced its first two 747-100s (ex-Delta Air Lines aircraft) in 1976 and immediately placed it on its Hong Kong-Taipei-Tokyo-Honolulu-Los Angeles route. Shortly thereafter, four brand new Boeing 747SP (Special Performance) were introduced in 1977. Due to political pressure, Japan ended its diplomatic ties with Taiwan in 1972, and all flights between Taiwan and Japan were stopped. The 747SP aircraft made it possible for China Airlines to fly daily nonstop services from Taipei to its North American destinations without stopping over in Japan. It also allowed the airlines to introduce flights to Saudi Arabia and South Africa. In 1979, the airlines switched all operations from the small downtown Songshan International Airport to the newly built Chiang Kai-shek International Airport (current Taiwan Taoyuan International Airport). Following the introduction of 747-200s, the airlines introduced its first European destination, Amsterdam. In 1978, Japan allowed China Airlines to return to Tokyo International Airport at Haneda after relocating all other airlines at the New Tokyo International Airport at Narita, leaving China Airlines as the sole international operator at Haneda, which at the time was an exclusive domestic facility. The premise being that air carriers from the PRC and Taiwan were prevented crossing paths at any Japanese airports. Thus CAL's Osaka service, due to the city's only airport at Itami, would not be reinstated until years later. Oddly enough, the crossing of flag-carriers (Taiwan based-airlines and Mainland China PRC based-airlines) occurred almost hourly at then British-controlled Hong Kong's Kaitak International Airport. Adversely, other regional airports such as Bangkok, Singapore and Manila were entirely spared of this indignity imposed on Japan by China. The next 20 years saw sporadic but far-reaching growth for the company. Later, the airline inaugurated its own round-the-world flight: (Taipei-Anchorage-New York-Amsterdam-Dubai-Taipei). 1993 saw China Airlines listed on the Taiwan Stock Exchange. Later CAL would place one of the largest orders for the newest Boeing 747. The new 747s and an earlier an order with Airbus for over a dozen A300B4 wide body regional jets allowed for addition destination growth. 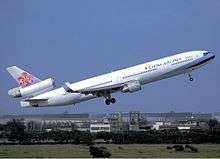 As Taiwan's flag carrier, China Airlines has been affected by disputes over the political status of Taiwan, and under pressure from Mainland China was barred from flying into a number of countries maintaining diplomatic relations with the PRC. As a result, in the mid-1990s, China Airlines subsidiary Mandarin Airlines took over some of its Sydney and Vancouver international routes. Partly as a way to avoid the international controversy, in 1995 China Airlines unveiled its "plum blossom" logo, replacing the national flag, which had previously appeared on the tail fins (empennage), and the aircraft livery from the red-white-blue national colors on the fuselage of its aircraft. The plum blossom (Prunus mume) is Taiwan's National Flower. Due to improving cross-strait relations, the first cross-strait charter flights between Taiwan and China were introduced in 2003, with China Airlines' flight 585, operated by a Boeing 747–400, being the first Taiwanese flight to legally land in China. (The aircraft took off from Taoyuan Airport, stopped over at Hong Kong Airport, and landed at Shanghai Pudong Airport.) In 2005, the first nonstop cross-strait charter flights were initiated, with China Airlines' flight 581 (Taoyuan Airport to Beijing Capital Airport) being the first flight of the program to depart from Taiwan. In 2008, the first regular weekend charter flights between Taiwan and China started operating, with daily charter flights introduced later in the year. In 2009, regularly scheduled cross-strait flights were finally introduced. China Airlines signed an agreement to begin the process of joining the SkyTeam airline alliance on September 14, 2010 and officially became a full member on September 28, 2011. This was marked by an update to the logo of the airline and the typeface in which "China Airlines" is printed. The carrier was the first Taiwanese airline to join an airline alliance. In December 2013, China Airlines announced its new joint venture with Singaporean low cost carrier Tigerair Holdings to establish Tigerair Taiwan. The new airline flew its inaugural flight to Singapore on 26 September 2014 and became the first low-cost carrier in Taiwan. China Airlines Group currently holds a 90 percent share in the new carrier (China Airlines 80%, Mandarin Airlines 10%), while Tigerair Holdings holds the other 10 percent. In March 2014, China Airlines announced that it will be launching a "NexGen (Next Generation)" plan to complement the delivery of its first Boeing 777-300ER. The plan, designed to refresh the carrier's brand image, includes fleet replacements, product innovations, and new uniform introductions. Through cooperating with designers from the Greater China region, the carrier hopes to introduce unique product offerings that can showcase the beauty of the East and the cultural creativity of Taiwan. The first phase of the plan has been rolled out following the delivery of China Airlines' first Boeing 777-300ER and the renovation of the carrier's lounge at Taiwan Taoyuan International Airport Terminal 1. In June 2015, the William Chang-designed new uniforms debuted; in August 2015, the flight attendants started appearing in the new uniforms. In September 2016, the airline received its first Airbus A350-900XWB, featuring a second version of next generation China Airlines cabin design. Future phases of the plan includes the retirement of the Boeing 747-400 and Airbus A340-300. Also anticipated is the announcement of new narrow-body and regional wide-body orders. Following the retirement of 747s from North American routes, China Airlines has terminated its First Class services. First Class seats are now marketed as Business Class ones. In January 2015, China Airlines established Taiwan Aircraft Maintenance & Engineering Co. (TAMECO), an airline maintenance, repair and overhaul (MRO) company which will start operations in June 2017. TAMECO will focus on Boeing 777, 737 and Airbus A350, A320 fuselage maintenance. On 25 June 2016, the Taoyuan Flight Attendants Union, representing some 2500 cabin crew from China Airlines, staged the first strike in Taiwanese aviation history. A total of 122 China Airlines-passenger flights from Taoyuan International Airport and Taipei Songshan Airport were cancelled as a result. The strike ended within a day following government intervention, replacement of top officials, and management-representatives conditionally agreeing to all seven demands from the union. Following the shut down of TransAsia Airways, China Airlines received a directive from the Executive Yuan to fly 15 TransAsia Airways-routes, many exclusively served by TransAsia Airways. The temporary takeover will occur between 1 December 2016 and 15 February 2017, when air traffic rights previously obtained by TransAsia Airways will be re-distributed by the Civil Aeronautics Administration. China Airlines has its headquarters, CAL Park (Chinese: 華航園區; pinyin: Huáháng Yuánqū), on the grounds of Taiwan Taoyuan International Airport in Dayuan Township, Taoyuan County. CAL Park, located at the airport entrance, forms a straight line with Terminal 1, Terminal 2, and the future Terminal 3. Prior to introducing the current "plum blossom" livery in 1995, the livery of China Airlines featured Taiwan's flag on the tail. The livery-change was due to political pressure from the Chinese government. 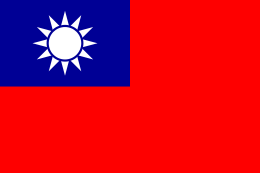 The mainland government prohibited any aircraft displaying Taiwan's flag to land in the mainland, Hong Kong and Macau. It also pressured other countries to carry out similar bans. This forced China Airlines to change its corporate identity in order to avoid having operations affected. In 2011, after joining Skyteam, the carrier made alterations to its logo as part of refreshing the brand image. A new font was chosen for the company name and a new approach was taken for the appearance of the plum blossom trademark. China Airlines has had many uniforms since its establishment in 1959. The current uniform was introduced in 2015 to celebrate the carrier entering a "NexGen" Next Generation Era. Designed by Hong Kong-based costume designer William Chang, the new uniforms are now worn by flight attendants. Ground staff will start wearing the uniforms in September 2015. China Airlines has its largest hub at Taiwan Taoyuan International Airport, which is the largest airport in Taiwan and is located near the national capital of Taipei. China Airlines operate out of both Terminal 1 and 2 at the airport. Operations to Europe, India, Korea, Hong Kong and Southeast Asia are located at Terminal 1 while those to China, Japan, North America and Oceania are located at Terminal 2. Additionally, China Airlines and its domestic subsidiary Mandarin Airlines operate numerous flights out of Kaohsiung International Airport and Taipei Songshan Airport. International flights from Songshan Airport to three Northeast Asian downtown airports, namely Tokyo-Haneda, Seoul-Gimpo and Shanghai-Hongqiao, have important significance to the carrier as the routes form a Northeast Asia Golden Flight Circle. The expansion of China Airlines international presence has long been limited by the political status of Taiwan. Currently, the carrier is still unable to offer flights to destinations such as Paris. Flights to Mainland China were also not permitted until 2003, when the carrier's Chinese New Year charter flight 585 from Taipei-Taoyuan to Shanghai-Pudong via Hong Kong made China Airlines the first Taiwanese carrier to legally land in Chinese mainland and the first carrier to legally fly between the two areas after their split during the civil war. The carrier operated occasional cross-strait charter flights for another few years until 2008, when regular charters flights started. In 2009, a new air service agreement allowed China Airlines to start regularly scheduled flights to the Mainland. Since then, China has quickly become the second largest market for China Airlines, with over 130 flights to 33 destinations across the Mainland. Over the period between 2011 and 2015, China Airlines focused on strengthening its regional network; from 2015 to 2020, the carrier will start expanding its European, North American and Oceanian network with the new long-haul fleet. In North America, the carrier is considering launching Boston, Chicago, Seattle, and Toronto; in Europe, destinations being considered include London, Milan, Paris and a Spanish destination, either Madrid or Barcelona. Other long-haul network plans include upgrading aircraft types and altering routings. China Airlines has replaced the Boeing 747-400 with Boeing 777 on all passenger flights to Frankfurt, Los Angeles, New York City, San Francisco. In the future, all European destinations (excluding Frankfurt and Vienna) will be flown nonstop with the Airbus A350 XWB, affecting the existing Amsterdam services via Bangkok and Rome services via Delhi. Services to Oceania and Hawaii are also likely to be flown by the A350. Regarding its regional network, China Airlines is actively supporting the "New Southward Policy" of the Taiwanese government by adding frequencies to Southeast Asia. On the other hand, Japanese routes are seeing frequency-cuts due to oversupply in the market while Mainland-business is also being downsized due to tense cross-strait relations. In addition, China Airlines has a codeshare agreement with Deutsche Bahn (DB). Under the agreement, China Airlines places its CI code on seven Frankfurt-initiating DB routes, including those to Cologne, Düsseldorf, Hamburg, Hanover, Munich, Nuremberg, and Stuttgart. In 2008, China Airlines firmed up an order for 14 Airbus A350-900 aircraft along with another 6 options. In 2012, an order for 6 Boeing 777-300ER and a lease agreement with GECAS for 4 more of the type were confirmed. Both the Airbus A350-900 and Boeing 777-300ER will be replacements of the carrier's Airbus A340-300 and Boeing 747-400 on intercontinental routes. Deliveries of the Boeing 777-300ER started in 2014 and were completed in 2016. The first Airbus A350-900 was delivered in 2016; the remainder will be delivered by 2018. The six options for the A350 will expire in late-2017. The decision to switch the options to firm orders will be based upon the performance of the aircraft on European nonstop routes. A regional wide-body order is currently in the early phases of being planned. A retrofit program is also underway for the 14 self-owned A330. The first retrofitted A330 is expected to roll out 2Q 2017 with 30 angled lie-flat seats in Business Class and 277 seats in Economy Class. Fleet overhaul is expected to be done at a rate of one aircraft per month. Upon completion, the program will homogenize the layout of the A330-300 fleet. Regarding the narrow-body fleet, the airline is planning on ordering 35 narrow-body aircraft for itself and its subsidiaries Mandarin Airlines and Tigerair Taiwan. Types in consideration include the Boeing 737MAX and Airbus A320neo. The order was originally planned to include around 50 aircraft. However, due to drastic market changes, including the decline of Mainland visitors and oversupply in the Japanese markets, the type and size of the new narrow-body fleet is being reconsidered. The airline has been leasing various Airbus A330-300s and Boeing 737-800s to meet short term demands. Of the wet-leased planes, one 737 has been dry-leased to subsidiary Mandarin Airlines. One more 737 will be leased to Mandarin Airlines in 2016. In June 2014, China Airlines announced plans to, by the end of 2017, retire all Boeing 747-400 delivered before 2004, partially retire the Boeing 737-800 fleet, while fully retiring the Airbus A340-300 fleet. Since December 2014, the company has stored 6 Boeing 747–400, namely B-18201, B-18202, B-18203, B-18206, B-18251, and N168CL, at an aircraft boneyard at Victorville Airport. As for the A340 fleet, B-18801 is in storage while B-18802 was sold to the government of Swaziland. All stored passenger aircraft are to be sold eventually. Regarding the Boeing 747-400 passenger fleet, due to falling oil prices, only the 747s produced before 1998 will be retired in the upcoming years. The 4 newer 747s (delivered between 2004 and 2005) will be kept to operate high demand cross-strait and regional flights. As for the Boeing 737-800 fleet, 6 aircraft are now put up for sale. As for subsidiary Mandarin Airlines, China Airlines announced that two ERJ190s will be retired and replaced by two new Boeing 737-800s. 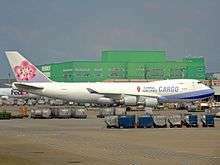 China Airlines Cargo, the freight division of China Airlines, currently operates a fleet of 18 freighters to 33 destinations across Asia, Europe and North America, in addition to utilising the cargo space on passenger aircraft. Over the past few years, it has been suffering from falling freight demands and has stored 3 Boeing 747-400Fs at Victorville Airport. In early 2015, due to improving global economic conditions, the carrier decided to reactivate 1 stored freighter plane. However, as demand has once again decreased, the plan has been put on hold. China Airlines has twice partnered with Boeing to introduce planes carrying the combined livery-design of the two companies. The first co-branded livery aircraft was a Boeing 747-400, which first flew in 2004 and was painted back to the original livery in 2012. The second co-branded livery aircraft was painted on a Boeing 777-300ER and delivered in May 2016. In 2016, China Airlines announced that the Airbus A350-900 fleet will have a naming theme that combines endemic birds and unique features of Taiwan. The first two A350s were named as Mikado pheasant and Taiwan blue magpie by the airline. The names of the remaining 12 aircraft were selected by the Taiwanese public online from a total of 24 choices. In 2013, China Airlines revealed plans start a series of Taiwan-themed special livery aircraft. The carrier will collaborate with Taiwanese artists, cultural workers, and tourism bureaus to design the special liveries. B-18806 (Airbus A340-300) – "The Official Airline for Climate Monitoring" Livery, in collaboration with the Environmental Protection Administration, the Ministry of Science and Technology and the National Central University. The plane is equipped with the "In-service Aircraft for a Global Observing System (IAGOS)" to monitor global climate changes. Prior to wearing the current livery, the plane was part of the 50 year anniversary jet series. In 2009, China Airlines decorated one plane of each of its plane type with the 50th anniversary logo. All planes of the series are now wearing the regular corporate livery or another special livery. China Airlines has terminated First Class services since 1 July 2015. However, it still offers the hardware product on seven three-class Boeing 747 aircraft and markets the seats as Business Class ones. There are 12 flat-bed First Class seats located in each of the three-class Boeing 747s nose sections. Each seat features a 15.1-inch personal screen with Audio and Video On Demand (AVOD), USB port, universal power outlet, and noise cancelling headphone. Turndown service is offered by cabin crew upon request. On the long haul Airbus A330-300s, there are 36 shell seats with 63" of pitch and 166° of recline; on the short haul A330s, there are 30 shell seats with 52" of pitch and 140° of recline. On Airbus A340-300s, there are 30 recliner-style seats with 60" inches of pitch and 150° of recline. All Business Class seats on the Airbus fleet have in-seat power and personal television screens. Boeing 747 aircraft equipped with First Class flatbed-seats have 49 Business Class recliner seats, while those without First Class have 70. All seats offer 60" of pitch and in-seat power. The recliner seats of the 375-seat 747s have 140° of recline and 10.4" IFE displays, while the shelled angled-lie-flat seats of the refurbished 380 and 389-seat 747s have 160° of recline and 15" IFE displays. Boeing 737-800 aircraft are equipped with 8 recliners styles seats with 40" of pitch. On the Taipei – Vancouver route, the deployed Boeing 747–400 also offers Premium Economy Class product. It utilizes the existing recliner Business Class seats and allows passengers to pay lower fares for better hardware facilities. Economy Class on all aircraft features 31–32" of pitch and, except on Boeing 737 aircraft, IFE screens ranging from 6.5" to 11.1" inch size. Family Couch is featured on long haul flights operated by the Boeing 777-300ER and the Airbus A350-900XWB. It is a set of three Economy class seats, in the first 10 rows on the right of the Economy Class cabin on the 777 and first 4 rows on the A350, that can be easily converted into a large surface area. By booking three adjacent Family Couch seats on long-haul flights, passengers can lie flat on their backs. Fantasy Sky, the in-flight entertainment system of China Airlines, is available on all aircraft types excluding the Boeing 737–800. The system comes in three languages: Traditional Chinese, English and Japanese. Over 100 movies are offered in addition to television shows, songs, and video games. Other functions include exterior camera views, company information, and connecting flight data (available prior to landing). Furthermore, on the Boeing 777-300ER, "Fantasy Sky" features Duty Free catalogues, E-Books, surveys and chatrooms. In-flight Wi-Fi, utilizing the T-Mobile systems and Ku band satellite disks, is available on the Boeing 777-300ER and Airbus A350-900 once the plane reaches cruising altitude. Passengers can enjoy internet connection by paying through the system. There are also free services such as news articles and weather information. Phone calls and video chat are not permitted on the system. China Airlines publishes a total of 3 in-flight magazines for its passengers: DYNASTY, Fantasy Sky, and Sky Boutique. DYNASTY, the China Airlines magazine, has articles in English, Chinese, and Japanese. The articles feature local and international events, descriptive culture, social introductions, personal interviews, in-flight entertainment instructions, and China Airlines' news. Fantasy Sky, China Airlines' in-flight entertainment guide, provides information on the movies, videos, music, and radio channels being offered. Sky Boutique is China Airlines' duty-free catalogue. Dynasty Flyer is China Airlines' frequent flyer program. There are four tiers where three elite tiers are Gold, Emerald, and Paragon. Members can qualify for these elite tiers by earning enough air miles and/or segments within 12 calendar months. Elite members have more privileges such as access to the VIP Lounge, a higher checked baggage allowance, and being able to upgrade their ticket to a different cabin. All elite memberships last two years and soft landings are available. China Airlines' airline lounges are called Dynasty Lounge and Dynasty Supreme Lounge. There are a total of 9 China Airlines lounges at 7 different airports. Lounge services at other China Airlines destinations are offered by Skyteam, partner airlines, or local operators. The Dynasty Supreme Lounge is exclusive for Dynasty Flyer Emerald and Paragon card holders. Currently, there is only one Dynasty Supreme Lounge, located in Terminal 2 at Taiwan Taoyuan International Airport. The lounge features 65 seats, suites in different sizes, and shower rooms. Dining services and computers are offered while Wi-Fi is available throughout the lounge. The Dynasty Lounge is available to Business Class passengers and Dynasty Flyer Gold, Emerald, and Paragon card holders. Two-section lounges include an Exclusive Area, for Dynasty Flyer Emerald and Paragon card holders, and a Business Class Area, for Business Class passengers and Dynasty Flyer Gold card holders. In Greater New York, the airline operates a bus to John F. Kennedy International Airport from Fort Lee, Parsippany-Troy Hills, and Edison in northern New Jersey, and several points in Greater Philadelphia, including Cherry Hill, New Jersey, Center City Philadelphia, and South Philadelphia. In Los Angeles, a bus transports customers between Los Angeles International Airport, Monterey Park and Rowland Heights. Since 2012, China Airlines has been participating in the Pacific Greenhouse Gases Measurement (PGGM) Project, led by the Environmental Protection Administration, Ministry of Science and Technology, and National Central University. As part of the collaboration, China Airlines equipped B-18806, an Airbus A340-300, with the "In-service Aircraft for a Global Observing System (IAGOS)" to monitor global climate changes. The aircraft, decorated with the "The Official Airline for Climate Monitoring" special livery, became the first to take atmospheric measurements on trans-Pacific routes. Between July 2012 and June 2016, the aircraft collected greenhouse gases-data from a total of 2445 flights. China Airlines has diversified into related industries and sectors, including ground handling, aviation engineering, inflight catering. On 2 January 1969, Flight 227, a Douglas C-47A, struck the side of Mount Dawu (大武山, elevation 3090 m), Taiwan after encountering turbulence and a downdraft. The aircraft was operating a domestic scheduled passenger flight from Taitung Airport to Kaohsiung International Airport. All 24 passengers and crew were killed. On 24 March 1975, Douglas C-47A B-1553 crashed at Kompong Cham following a mid-air collision with a Cessna L-19 Bird Dog. On 11 September 1979, Boeing 707-320C, registration B-1834, crashed off Chiang Kai-shek International Airport shortly after takeoff during a training flight, killing all six crew on board. On 27 February 1980, Flight 811, a CAL Boeing 707-300C, registration B-1826, crashed short of the runway at Manila International Airport, killing two of 135 on board. On 21 August 1983, Flight 811, a Boeing 767–200 from Taipei, landed in Manila International Airport. Benigno Aquino Jr. the former senator in Philippines was assassinated after being escorted from the plane. On 16 February 1986, Flight 2265, a Boeing 737–200, crashed 12 mi off Makung, Penghu, killing 13. During landing, a nosewheel tire blew. The crew performed a go-around during which the aircraft crashed; the wreckage was found on March 10 in 190 feet of water. On 3 May 1986, Flight 334, a Boeing 747-200F, was hijacked by its pilot, who landed the plane in Guangzhou, China where he defected. The ROC government sent a delegation to discuss with their mainland counterpart regards the return of the plane and 2 remaining crew. On 26 October 1989, Flight 204, a Boeing 737–200, struck a mountain near Hualien, Taiwan after the crew used the climbout procedure of the incorrect runway, causing the aircraft to make a wrong turn. All 54 passengers and crew aboard were killed. On 4 November 1993, Flight 605, a brand new Boeing 747–400, overran the Kai Tak Airport runway 13 while landing during a typhoon. It had touched down more than 2/3 down the runway and was unable to stop before the end of the runway, finishing up in Hong Kong harbor. All 396 people on board were safely evacuated but the aircraft was written off. The vertical stabilizer was dynamited away due to its interference with Kai Tak's ILS systems. On 20 August 2007, Flight 120, a Boeing 737–800 inbound from Taipei caught fire shortly after landing at Naha Airport in Okinawa Prefecture, Japan. After stopping on the tarmac, the engine started smoking and burning, and later exploded causing the aircraft to catch fire. A statement from the airline confirmed that all passengers and crew members were safely evacuated, and a ground engineer knocked off his feet by the blast was unhurt. The cause of the explosion has been attributed to a fuel leak caused by a bolt from the right wing slat puncturing the fuel tank. 1 2 "華航董事會通過何煖軒、謝世謙人事案". SET News. SET News. Retrieved 24 June 2016. 1 2 3 4 5 6 7 8 9 "China Airlines Annual Report 2014" (PDF). www.china-airlines.com. China Airlines. Retrieved 26 June 2014. ↑ "China Airlines – About". www.china-airlines.com. China Airlines. Retrieved 15 July 2014. ↑ "國籍航空公司全球航線客貨運概況" (PDF). www.caa.gov.tw. CAA Taiwan. Retrieved 15 July 2014. ↑ "華航國際貨運量 全球第6". UDN.com. UDN.com. Retrieved 26 June 2015. 1 2 Shih, Kai-Chin. "LCC War Kicks Off In Taiwan: Tigerair Taiwan and V Air Ready To Take To The Skies". Talkairlines. Retrieved 27 September 2014. 1 2 "CAL at a Glance: Fact Sheet". China Airlines. Retrieved 2010-12-13. 1 2 3 "CAL at a Glance: Looking Back". China Airlines. Retrieved 2010-12-13. ↑ "China Airlines Once Again Passes Rigorous Safety Audit" (Press release). China Airlines. 2009-03-18. Retrieved 2010-12-13. ↑ Moestafa, Berni (2010-06-29). "Hyundai Engineering, Spark, Rusal: Asia Ex-Japan Equity Preview". BusinessWeek. Retrieved 2010-07-26. 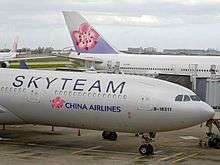 ↑ "SkyTeam Tightens Grip On Greater China Market". aviationweek.com. 2010-09-14. Retrieved 15 September 2010. ↑ Wang Shu-fen; Huang, Frances (2010-09-04). "China Airlines to join Sky Team Alliance". Focus Taiwan. Retrieved 2010-12-13. 1 2 Shih, Kai-Chin. "China Airlines "Next Generation Plan" Part I: The New Boeing 777-300ER Cabin". Talkairlines. Talkairlines. Retrieved 11 July 2014. 1 2 "China Airlines Debuts William Cheung-Designed Uniforms". talkairlines. talkairlines. Retrieved 13 June 2015. ↑ "China Airlines Eyeing Aircraft Maintenance Business". WCARN. WCARN. Retrieved 24 March 2015. ↑ "空服員罷工 華航2天營損2.8億元". China Times. China Times. Retrieved 25 June 2016. ↑ "CAL WILL TAKE OVER 15 TRANSASIA ROUTES UNTIL FEB 2017". PTS. PTS. Retrieved 26 November 2016. ↑ "「華航園區新建工程」1月31日隆重舉行開工動土典禮2009年底完工 將成為台灣桃園國際機場地標." China Airlines. Retrieved on April 24, 2010. "「華航園區」預定2009年底前完工營運， ..."
↑ "China Airlines Inaugurates CAL Park at Taoyuan Airport" (Press release). China Airlines. 2010-03-26. Retrieved 2010-03-26. ↑ "Investor Relations Archived March 6, 2009, at the Wayback Machine.." China Airlines. Retrieved on May 20, 2009. "Address: No.131, Sec. 3, Nanjing E. Rd., Taipei City 104, Taiwan (R.O.C.)" ↑ "Cargo." Taiwan Taoyuan International Airport. Retrieved on March 15, 2010. "Address: 12F., No.131, Sec. 3, Nanjing E. Rd., Songshan District, Taipei City 105, Taiwan (R.O.C.)." ↑ "Branch Offices Taiwan Area." China Airlines. Retrieved on April 24, 2010. "No.131, Sec. 3, Nanjing E. Rd., Taipei City 104, Taiwan (R.O.C.)" ↑ Lee, Cheng Yu (27 August 2011). "華航紅梅改版 潑墨味淡了？". World Journal. World Journal. Retrieved 11 July 2014. ↑ "華航高雄九州紅不讓 接力開航熊本福岡". CNA. CNA. Retrieved 26 October 2015. ↑ "China Airlines Launches Taipei Songshan-Seoul Gimpo Service on April 30". China Airlines. China Airlines. Retrieved 24 February 2015. ↑ "2003年2月，兩岸首次實現春節包機". Huaxia.com. Huaxia.com. Retrieved 24 February 2015. ↑ "2009年8月31日起正式啟動兩岸定期航班". Taiwan Economic Cultural Office in Atlanta. Taiwan Economic and Cultural Office in Atlanta. Retrieved 24 February 2015. 1 2 3 4 5 6 7 8 9 "A350-900XWB Cabin Interiors and Route Plans". talkairlines. >talkairlines. Retrieved 27 Oct 2016. ↑ "華航董座專訪／華航開源節流 賺錢擺第一". UDN. UDN. Retrieved 1 October 2016. ↑ "華航搶攻飛機維修 何煖軒自爆向長榮學習". CNA. CNA. ↑ "華航今年獲利 可望飛躍39億". China Times. China Times. Retrieved 13 August 2016. ↑ "共用航班夥伴". China Airlines. China Airlines. Retrieved 2 November 2016. ↑ "Profile on China Airlines". CAPA. Centre for Aviation. Archived from the original on 2016-10-30. Retrieved 2016-10-30. ↑ "China Airlines / Air Europa Begins Codeshare Partnership from late-March 2016". Routes Online. Airline Route. Retrieved 2 November 2016. ↑ "QANTAS CUSTOMERS TO ENJOY DIRECT FLIGHTS TO TAIWAN WITH CHINA AIRLINES". Qantas. Qantas. Retrieved 2 November 2016. ↑ "Rail&Fly Unsere Partner Airlines – Our Partner Airlines" (PDF). Deutsche Bahn. Deutsche Bahn. Retrieved 2 November 2016. ↑ "China Airlines Fleet Details and History". Planespotters.net. 24 November 2016. Retrieved 24 November 2016. 1 2 "China Airlines To Refurbish Airbus A330-300 Fleet". Talkairlines. Talkairlines. Retrieved 8 September 2016. ↑ "China Airlines, Airbus and Rolls-Royce Sign Purchase Agreement for 20 New A350 Aircraft" (Press release). China Airlines. 2008-01-22. Retrieved 2010-12-13. 1 2 "China Airlines Fleet Plans". Talkairlines. Talkairlines. Retrieved 24 July 2014. ↑ "China Airlines takes delivery of first A350XWB". ATW Online. ATW Online. Retrieved 2 October 2016. 1 2 3 "汰換舊機... 華航 租6架新波音機". ChinaTimes. ChinaTimes. Retrieved 2 October 2015. ↑ Shih, Kai-Chin. 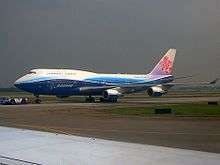 "China Airlines Initiates Boeing 747–400 Retirement Process". Talkairlines. Talkairlines. Retrieved 11 July 2014. ↑ "華航新空巴入列 歐洲線12月全數直飛". CNA. CNA. Retrieved 1 October 2016. ↑ "華航A350新機 明年Q3起見客". China Times. China Times. Retrieved 21 May 2015. ↑ "華航Q4好旺 貨運展翅高飛". 聯合理財網. Retrieved 27 November 2013. ↑ "華航孫洪祥：今年展望樂觀；日本線旺到年底". MoneyDJ.com. MoneyDJ.com. Retrieved 26 June 2015. ↑ "First ci's special livery aircraft to promote taiwan tourism". China Airlines. 1 2 3 "China Airlines Makes History With Newest 777-300ER". Boeing. Boeing. Retrieved 17 May 2016. ↑ "China Airlines Launches A350 "Flying Ambassador" to Explore the Beauty of Taiwan". China Airlines. China Airlines. Retrieved 8 October 2016. 1 2 3 4 5 Shih, Kai-Chin. "China Airlines Unveils Cloud Gate Livery". talkairlines. talkairlines. Retrieved 24 July 2014. ↑ "中華航空全球首架跨太平洋氣候觀測機正式啟航". China Airlines. China Airlines. Retrieved 23 July 2014. 1 2 3 4 5 6 Shih, Kai-Chin. "China Airlines New Boeing 777-300ER Interior". talkairlines. talkairlines. Retrieved 16 July 2014. ↑ "China Airlines Reconfigured 747". China Airlines. China Airlines. Retrieved 15 July 2014. ↑ "調整台北-溫哥華航線(74C)哩程兌換座艙升等標準作業辦法". China Airlines. China Airlines. Retrieved 22 December 2015. ↑ "China Airlines Boeing 777-300ER Family Couch". Talkairlines. Talkairlines. Retrieved 24 July 2014. ↑ "9月起　搭這4家國籍航空可全程使用手機". Apple Daily. Apple Daily. Retrieved 30 August 2015. ↑ "中華航空《梅苑》貴賓室 旅客休憩頂級新選擇". China Airlines. China Airlines. Retrieved 15 July 2014. ↑ "Review of the Newly Renovated Dynasty Lounge at TPE Terminal 1". >talkairlines. >talkairlines. Retrieved 30 January 2015. ↑ "China Airlines and China Eastern Airlines Partner on First Greater China Region SkyTeam Exclusive Lounge at Hong Kong International Airport". China Airlines. China Airlines. Retrieved 28 October 2015. 1 2 "China Airlines releases special online promotions". Taipei Times Supplement. 2007-08-17. p. 4. Retrieved 2008-12-25. 1 2 "華航挺地球 啟用雙機廣蒐太平洋". China Airlines. China Airlines. Retrieved 11 July 2016. 1 2 Bruce Stanley (24 August 2007). "Will China Airlines' Rebound Stall?". Wall Street Journal. Retrieved 31 December 2013. ↑ "China Airlines back in the dock". BBC. 3 June 2003. Retrieved 31 December 2013. ↑ Accident description for B-309 at the Aviation Safety Network. Retrieved on 20 January 2013. ↑ Accident description for B-1852 at the Aviation Safety Network. Retrieved on 20 January 2013. ↑ "Accident description". Aviation Safety Network. Retrieved 20 August 2010. ↑ Accident description for B-1834 at the Aviation Safety Network. Retrieved on 20 January 2013. ↑ Accident description for B-1826 at the Aviation Safety Network. Retrieved on 20 January 2013. ↑ Accident description for B-1870 at the Aviation Safety Network. Retrieved on 20 January 2013. ↑ "China Airlines Boeing 737–800 destroyed by fire". Flight Global. 2007-08-20. Retrieved 2011-10-22. ↑ Debby Wu (2007-08-20). "165 Safe After Plane Explodes in Japan". The Guardian. Archived from the original on 2007-11-04. Retrieved 2007-08-20. ↑ Francis, Leithen (2007-08-24). "CAL 737–800 that caught fire had punctured fuel tank.". Flight Global. Retrieved 2011-10-22. Wikimedia Commons has media related to China Airlines. Ho, Jessie. "China Airlines takes air safety to new levels." Taipei Times. Monday December 24, 2004.